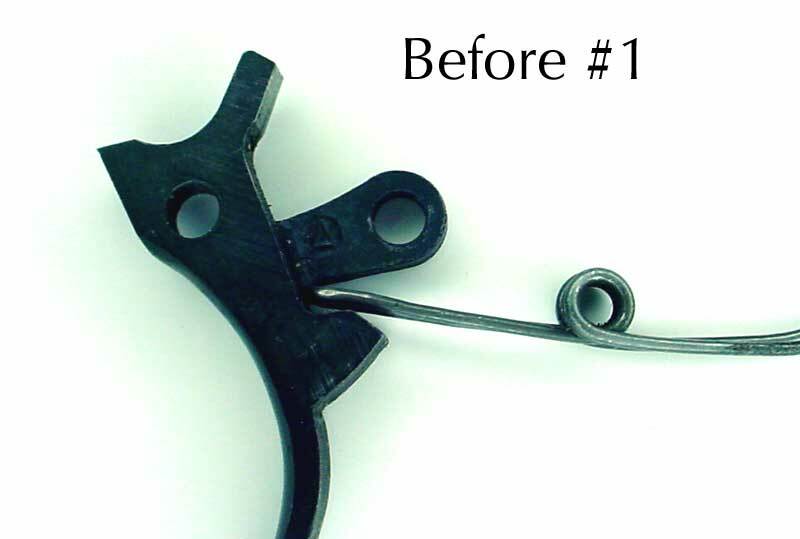 Adjusting Ruger New Model Trigger Springs.By J.Michael Cominskie AKA "Uncowboy". The next thing that should be done is that the trigger return spring should be reduced in strength. THIS IS WHAT LOWERS THE FELT PULL WEIGHT. 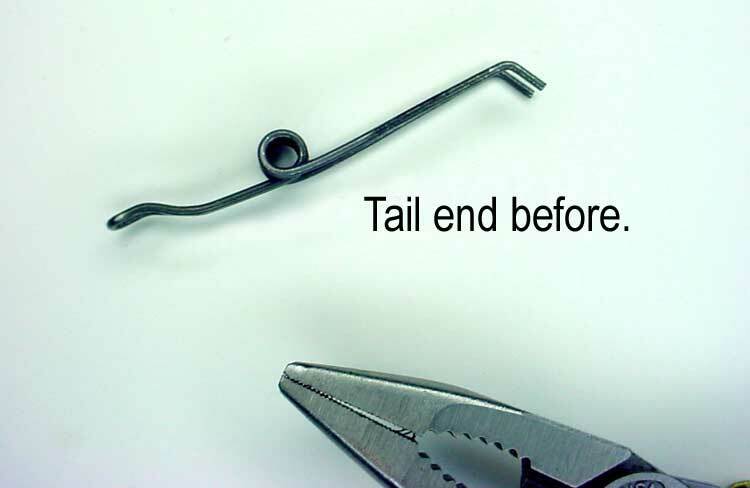 The Ruger Black Hawk is unique in that you do not have to disassemble the entire gun to get to the trigger return spring. First remove your Stocks or grip pannles , Second unhook the trigger return springs legs from the gripframe pin, Next tap out the trigger return retaining pin. NOTE: This requires very little effort. 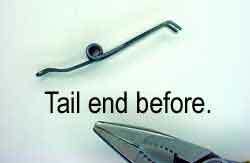 Next slide out the trigger return spring and start your alterations. #1The way I do this is a two step bend. First the trigger return spring has two ends, One is looped and rides on the flat of the trigger pushing down to reset the trigger when pulled reward, The other end is what hooks onto the gripframe pin and loads the spring. We will work on both of these ends. First thing to do is to put a bend on the looped part of the spring. 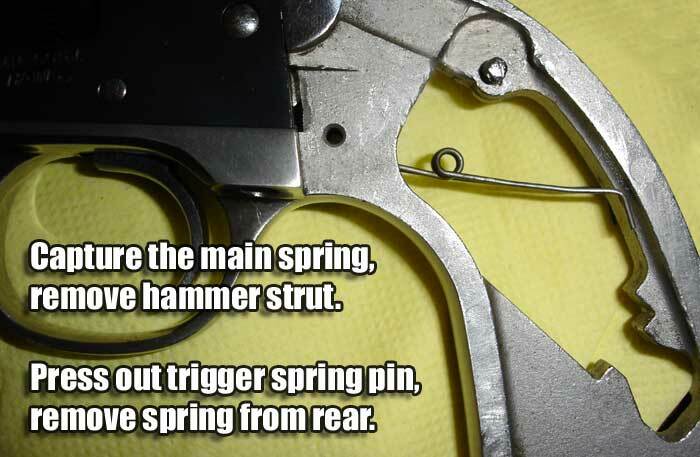 The reason for this is to lessen the contact the spring has on the trigger,When done right the springs looped end will be the ONLY part touching the trigger. We want to do this in a way that will put air between the spring and the REAR END of the trigger. 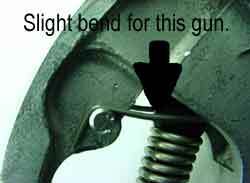 This end of the trigger must lift the entire spring when the trigger is pulled reward, This multiplies the pull weight of the spring. 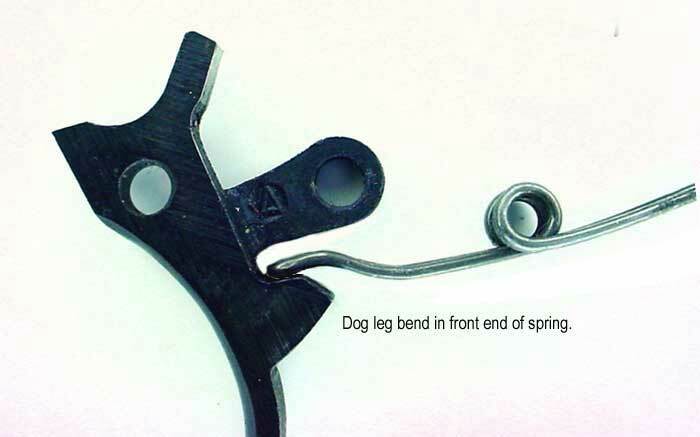 By eliminating the rear trigger contact of the spring the springs contact mearly resets the trigger. 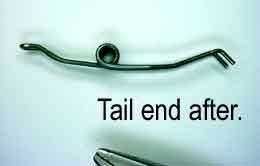 Your creap will be reduced when the contact between the rear fo the trigger and the spring is eliminated. #2The next part is to adjust the PULL WEIGHT of your action. 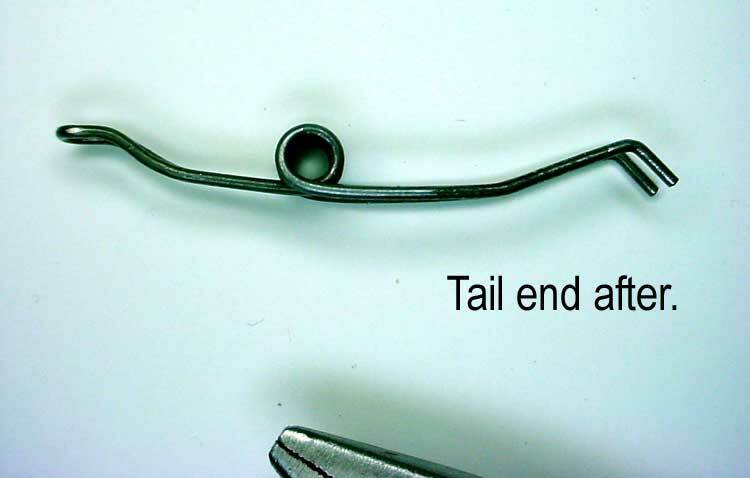 This is done by bending the hooked ends of the trigger return spring in equal amounts . By bending the spring hooks upward you will loosen the spring tension. Note: A little goes a long way! You can pop it in the gun and weigh your action. If you desire it lighter bend the springs some more, If you went to far Remove some of the bend. Test the gun before shooting by dry fireing it and cocking it fast. If the hammer slips you went too far and you must add more spring tension. 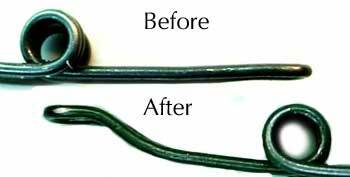 Ruger will sell you trigger springs so buy a few and pratice your bends you will get it in no time. "After" bend exaggerated for photographic purposes. 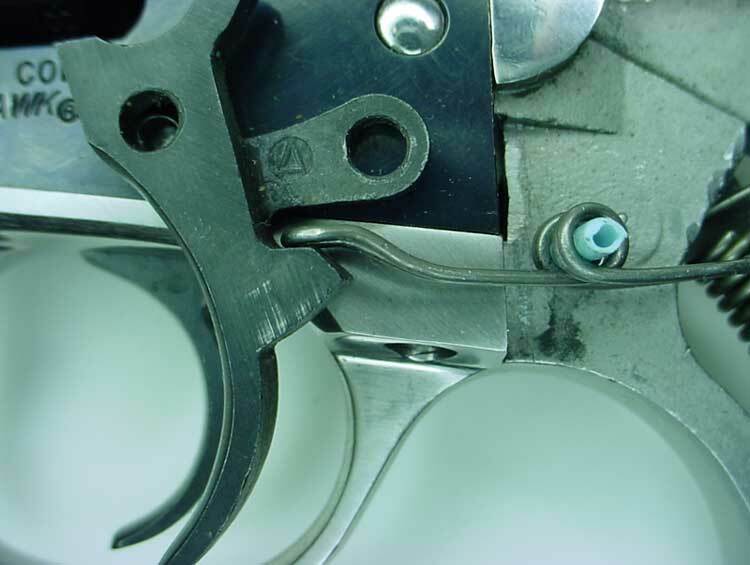 The information presented in this article assumes familiarity with basic gunsmithing and safe gun handling principles. The use of improper procedures may result in the creation of dangerous conditions and may result in severe injury or death. Any questions should be referred to a competent gunsmith. Neither the author nor Cylindersmith.com assumes any liability whatsoever for the readers application or use of any of the information contained herein and all work is done at the sole risk and expense of the reader.